Hotel Walloon is pleased to present The Last Good Country: Walloon Lake, an Ernest Hemingway Occasion. This third annual event celebrating Ernest Hemingway’s connection to the Northern Michigan area will take place Friday, April 27 through Sunday, April 29th. The three-day event package includes two nights’ accommodation at the 32-room boutique hotel. On Friday, the event begins with a meet-n-greet with Valerie Hemingway, who was both a personal assistant and daughter-in-law to the late author. 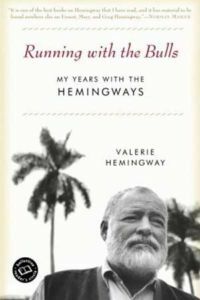 Ms. Hemingway is the author of Running with Bulls, a memoir of her years working with her father-in-law. The meet-in-greet will be accompanied by Ernest Hemingway inspired drinks and hors d’oeuvres, compliments of the Walloon Lake Inn. Following the meet-n-greet, guests of the event will accompany Valerie Hemingway and Chris Struble, of the Michigan Hemingway Society, to the historic Walloon Lake Inn for a “Nick Adam’s” Feast. On Saturday, guests will have the opportunity to take two guided tours highlighting many of the local areas featured in The Nick Adams Stories. The first will be a guided trolley tour of Horton Bay with Chris Struble, a local historian and President of the Michigan Hemingway Society. The second tour will consist of a guided walking tour around Petoskey, exploring Hemingway’s favorite places from back in the day. Guests will be encouraged to enjoy lunch at City Park Grill, one of Hemingway’s favorite places. In the evening guests will enjoy a cocktail hour and second meet-n-greet with Valerie Hemingway. Following the cocktail hour and meet-n-greet, Valerie Hemingway will share tales of Ernest Hemingway from her time as his personal assistant and daughter-in-law. Saturday evening’s cocktail hour, meet-n-greet and speaking engagement by Valerie Hemingway will take place at The Talcott Event Center, directly across the street from Hotel Walloon, and will be open to the general public. The weekend-long Hemingway celebration commences on Sunday, April 29, following the Sun Also Rises breakfast at Barrel Back Restaurant and a fly fishing demonstration by Brian Kozminski to honor the opening of trout season in Northern Michigan, a favorite past time of Ernest Hemingway. Centrally located between Petoskey, Boyne City, Harbor Springs, and Charlevoix on Walloon Lake, Hotel Walloon is the perfect “home away from home” to enjoy all the adventure Northern Michigan has to offer. Come experience the area that Hemingway enjoyed as a young man and fondly referred to as “The Last Good Country” in his writing. For more information and to book your reservation, please call 231.535.5000 or visit www.HotelWalloon.com. Click the cover to read MyNorth’s Petoskey Vacation Guide including Walloon Lake!